Rosehip oil is all the rage these days and, because I am a sucker always up for trying new products, I had already tried another brand previously. I think I lasted all of three days before the strong smell became too much and I gave it away (to a friend who was likewise turned off it). This particular brand smelt so deeply organic, as if I had just crushed up actual rotting rosehips from my garden and smashed them onto my face. Not pleasant. 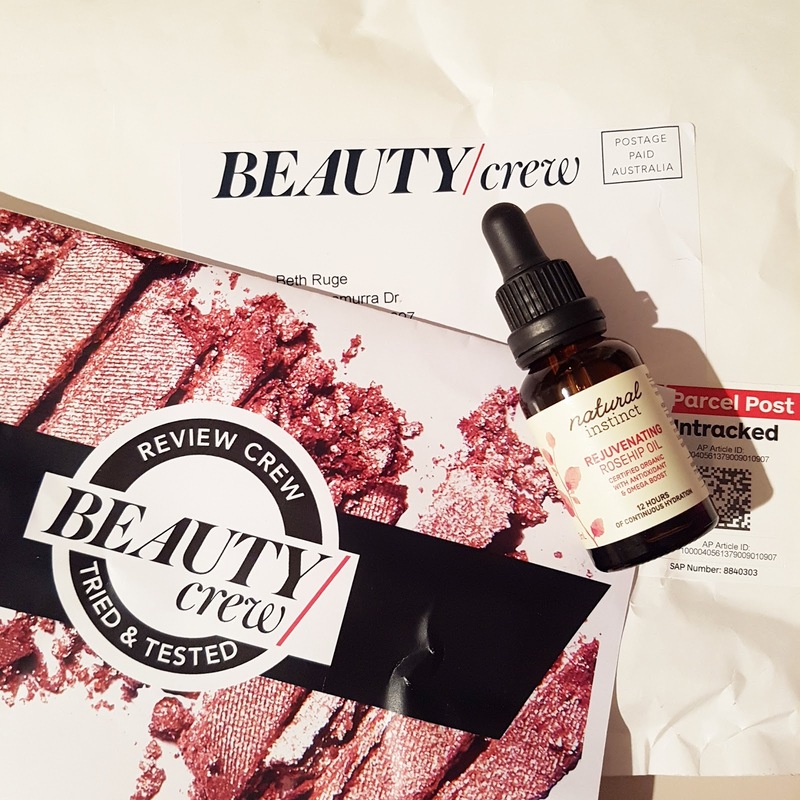 So when I got the opportunity to trial Natural Instinct’s Rejuvenating Rosehip Oil through Beauty Crew, I was keen to see if another brand might be more workable. Naturally, the first thing I did when I opened the bottle was have a sniff and I was both relieved and pleased to find the scent was so minimal, I had to take a really big whiff to even get any kind of scent. Already, we’re ahead. The packaging is nice and the scienctific squeezy dropper thing made it easy to distribute the product onto my head. My skin is pretty normal as far as skin goes and I tend to treat it fairly simply, with a foaming facial cleanser and light gel moisturiser. Anything too rich leads to milia seeds around the eye area so I avoid laying on a lot of skin care and don’t use a night cream. As directed, I applied to damp skin morning and night. It took a couple of tries to get the right dampness to product ratio in order to get the best massage consistency but once I had it worked out, it was easy and absorbed quickly. I was looking to reduce the look of pigmentation and lines, primarily on my forehead. Unlike Hot Chocolate, I don’t believe in miracles but I do believe in results. I noticed a definite reduction in pigmentation on the forehead after use and my forehead lines appeared less defined. On the flip side, I also noticed an increase in milia seeds around the eye area. After a week, I stopped using the product on my cheeks and chin and concentrated on the forehead where I continued to see improvement. You can use this product as a standalone or under your regular moisturiser, which I was doing. It’s certified organic and full of the kind of antioxidising, omega boosting natural ingredients that should satisfy most organic skincare fans and you can pick up a bottle for just under $20 if the mood takes you. How do you feel about rosehip oil? This review has also appeared at Beauty Crew. Product kindly gifted as part of the Beauty Crew review program. Please see my PR and Media policy for more information.